After reviewing items for a previous Facebook blog, I realized there are more Facebook features people might appreciate. Today our feature presentation will be the Save option. Grab a bag of popcorn, dim the lights, sit back, and enjoy. 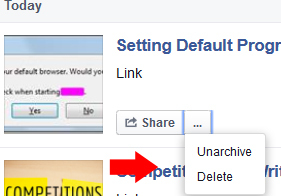 Did you know you can save posts on Facebook similar to bookmarking pages in an internet browser? First, a post has to have a direct link if you wish to save it. Don’t all posts? Nope. Posts without a direct link don’t offer a Save option. Facebook says you can track down the original post and save from a different Facebook page. We’ll talk about this later. 1) Click the dropdown menu in the right top of the post you wish to Save. 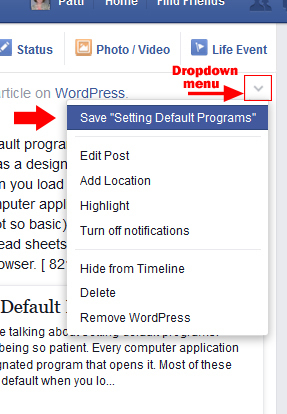 Using my last blog topic as an example, we’ll save “Setting Default Programs”. Easy, right? Now you’re probably asking yourself, How do I find my new saved Facebook posts. On your Facebook’s Home page, you have a left margin item named Saved. Here’s where all your favorite posts have been saved to view later. When you click Saved, your saved posts will open in a new window. Facebook is nice and categorizes them for you. When you don’t want a post any longer, you can delete it from your saved posts. 1). Archive the post you wish to delete by clicking the ‘x’ in the upper right of the post on your saved posts list. 3) Find the link you wish to delete, 4) Click the “…” , 5) Delete. 1) Right-click the time stamp and 2) left-click Copy Link Location. 3) Paste into your browser’s address bar, and go. 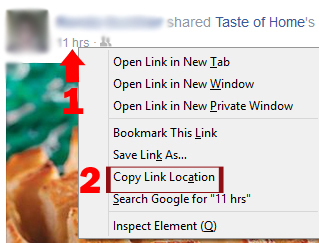 Earlier in this post I said “Facebook says” you can copy a link location because I followed one and never found any save options. I’m not certain if I could’ve followed the link farther back or if a Facebook user is just out of luck. Play around with it and see what you find. If you figure it out let me know in the comment section, I’d appreciate it. Facebook mobile apps can be used like a GPS to track users. This is bad if strangers wish to track your kids, but great if you do. For their sake, help them disable their Facebook mobile tracking: Settings>Messenger Location Services>Disable. There’s at least one, possibly more, websites where you enter a Facebook user name and it will try to hack that Facebook account for you. Horrible, isn’t it? I’m not going to post a name or link because these criminals don’t need the publicity. Just be aware that idiots abound in this world. Don’t be scared to use Facebook, just do everything in your power to keep your passwords safe. If you’d like help, read my post Creating the Safest Passwords. Facebook EULA statements you may or may not know. No clue what happens if they find out you have. I suppose they delete one. I’ve updated this section as originally I neglected to mention the usage of your information by Facebook is subject to your privacy settings. Facebook won’t use your items publically if you have your privacy settings restricted. And yes, if you have your settings as public, they can use them for advertising since they are a for-profit corporate entity. Your name and profile picture (as well as your cover photo, I believe), have always been public information regardless of your privacy settings. This entry was posted in Computer Technology and tagged Facebook, Facebook hacking, Facebook mobile GPS, Facebook save option, Patti's Pathways, pattispathways, safe password, terms of service on February 18, 2015 by Patti.